This is my first review – Sparrow seemed the perfect choice because I had eaten their veggie burgers many times before starting this blog. And geographically they are the closest to my apartment of all veggie-burger-serving restaurants (just a few blocks away!) Which is perfect because I have a strong appreciation not only for good veggie burgers but also for candle-lit bars with beautiful interior décor and delicious wine. My burger tonight was just as good as the ones I have previously eaten at Sparrow – they are served on both the brunch and dinner menus. The veggie patty itself is excellent– a mix of different veggies (chopped so finely that none stand out awkwardly) and breading, slightly crispy on the outside and warm and rich on the inside. The flavors and textures are exactly what I enjoy in a veggie burger. And topped with greens and a very tasty spiced mayo it is an immensely satisfying combination. I’m a sucker for a good mayo-based sauce, and Sparrow’s is superb. The sauce comes on the side though, so if you don't add it to the pita, the whole thing is vegan without it. The burger comes in a whole wheat pita rather than a normal bun, which is tasty and an interesting change from all the other veggie burgers I eat… it almost begs the question “does it really qualify as a burger?” Sparrow’s menu says it does, but the experience of eating it is just different from what you imagine when you think of eating a burger. It’s not that it ruins the overall taste – I think the pita actually works in favor of the patty and other fillings in this case. But the texture is not the same and the very act of picking it up and biting into it is not the same. A choice of green salad or fries (herbed or spicy) is offered with the burger. I have had the burger served with the green salad before, which came with a nice dressing and was very enjoyable. But the herbed fries are my favorite. Whether with a burger or just on their own, actually... if you are here drinking late at night and find yourself slightly hungry before the kitchen closes, you should definitely order them! i think you would really love that bar, actually. Is it possible to get the recipe? Dear Anonymous, you will have to contact Sparrow Tavern yourself to ask them for their recipe - I am not employed by or associated with the tavern (except as a patron, neighbor, and huge fan) so I do not know their recipes or their policy on giving that information out to customers. Mix it up and let it sit for an hour. Measure out a six ounce portion, then form into a patty and place on a lightly oiled baking sheet. Cook in the oven till done in the center. Remove from baking sheet and cook in frying pan with a little bit of oil until it hardens, (crunchy), slightly on the outside. Once it's crunchy, place in a pita with Frisee lettuce. When done, remove from oil and place on paper towel. If you want, lightly sprinkle with salt. 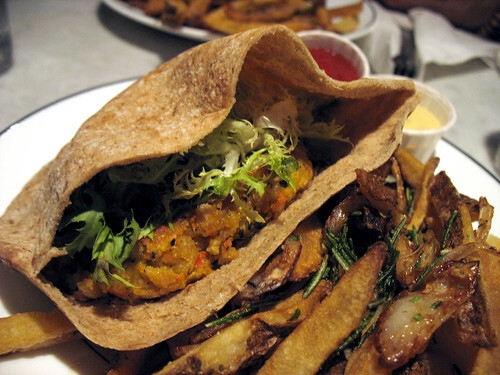 Serve Veggie Burger with Rosemary and Onion Fries and Sweet Cayenne Mustard on the side. Thanks Beth! I taped the show and was going to sit down and transcribe it when I stumbled over your entry all nicely done for me. I had a little bit of a hard time understanding Pablo's accent, but wanted it recepie for all the vegetarians in my family to make at our family reunion in May, 2012. Thanks again Beth! Thanks!! I usually can't find a pen & paper in time, and I can't write that fast!!! Beth, THANKS! I've been searching for the recipe after watching the D3 show. I think chick peas (garbanzo beans) were in the recipe, too. It looks delicious! April 22 comment....never mind, no chick peas.....but could be a good addition! Thanks, I just saw the show and would love to make these!!!!!!!!!!!!!!!!! Thanks i have been trying to find this all week. as said above--thank you beth--can't wait to make these!! !